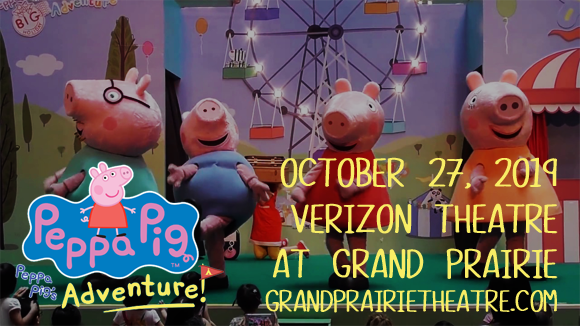 Peppa Pig's Adventure comes to to Verizon Theatre at Grand Prairie on Sunday 27th October 2019! Join Peppa, George and her school friends, including Pedro Pony, Suzy Sheep and Gerald Giraffe, as they get ready to go camping! With Daddy Pig driving the bus, Peppa and her friends enjoy all sorts of fun and games as they head out to the woods, and you can even sing along to some silly songs with them too! Peppa Pig's Adventure is a brand new live show, bringing all your favorite Peppa Pig characters to the stage for an engaging, interactive musical experience! Full of fun, games and singalong songs, Peppa Pig's Adventure is a colorful spectacular that's perfect for any little one's first show! Join Peppa as she heads off with George and her school friends, including Pedro Pony, Suzy Sheep and Gerald Giraffe, for an exciting camping adventure in the woods!